The hit Netflix series Marvel's Daredevil is getting ready for Season 3, and it seems that production will commence tomorrow. New parking notices for shoot known as "Ringside S3," the code name for Daredevil Season 3, indicating that filming will start tomorrow, November 13. There had been reports that filming on this season would start in late October, around Halloween, but it seems that filming was pushed by a few weeks, for reasons unknown. While this photo is certainly by no means an official confirmation of production beginning on this new season of Daredevil, it's possible that we may get an official announcement tomorrow, or perhaps the first photo from the set via the show's social media platforms. There has been no indication yet as to when exactly the season may debut, but it was confirmed this summer that Netflix is planning to release Daredevil Season 3, Jessica Jones Season 2 and Luke Cage Season 2, all within the calendar year of 2018. There is no indication as to whether Iron Fist may be added as well, and while that show has been renewed for a second season, it might not debut until late 2018, or perhaps early 2019. The last update we got on this season was quite a big one, with Marvel and Netflix confirming that Vincent D'Onofrio's Kingpin is returning for the third season. While this villainous character was an integral part of the first season, he took a backseat in the second season before returning again this season. Marvel's Daredevil follows the journey of Matt Murdock, who was blinded as a young boy but imbued with extraordinary senses, now fighting against injustice by day as a lawyer, and by night as the super hero Daredevil in modern day Hell's Kitchen, New York City. The third season of Marvel's Daredevil is Executive Produced by series Showrunner Erik Oleson and Drew Goddard, along with Jeph Loeb and Jim Chory. Erik Oleson is the third showrunner for Daredevil in as many seasons, with Stephen S. DeKnight serving as showrunner in the first season, with Douglas Petrie and Marco Ramirez replacing him in Season 2, who went on to serve as showrunners for The Defenders, which brought Daredevil, Jessica Jones (Krysten Ritter), Luke Cage (Mike Colter) and Iron Fist (Finn Jones) together. 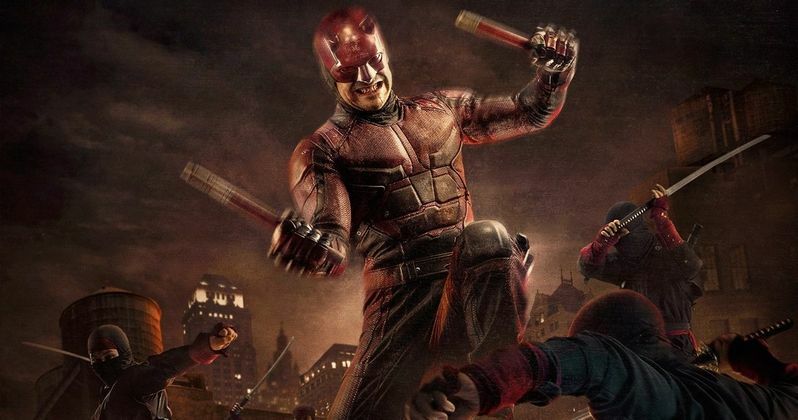 Daredevil is produced by Marvel Television in association with ABC Studios for Netflix. Netflix renewed Daredevil for Season 3 during the Marvel Netflix Comic-Con panel in 2016, just a few months after Season 2 debuted, with the third season eyeing a 2018 debut, although an exact date has not yet been given. Charlie Cox leads a cast that also includes Deborah Ann Woll as Karen Page, Elden Henson as Foggy Nelson, Rosario Dawson as Claire Temple, Scott Glenn as Stick, Toby Leonard Moore as Wesley, Vondie Curtis Hall as Ben Urich, Ayelet Zurer as Vanessa Marianna, Bob Gunton as Leland Owlsley, Matt Gerald as Melvin Potter, Peter Shinkoda as Nobu, Rob Morgan as Turk Barrett and Wai Ching Ho as Madame Gao. No details have been given for any new cast members or characters yet, but with production starting soon, we may get those details sooner rather than later. Take a look at these parking notices below, courtesy of Useable ID Twitter, that indicate Daredevil Season 3 starts filming tomorrw.